The proposed Collegetown rezoning is on to the City of Ithaca Common Council for a final vote after unanimously passing the Planning and Economic Development Committee. The measure – a drawn out and still contentious plan for some – seeks to rezone Ithaca’s most dense neighborhood using form districts that will regulate features such as roof pitch, glazing, porches, and size of plain exteriors. The plan calls for a total of six districts: two Mixed Use (MU) districts, which includes both residential and commercial spaces, and four Collegetown Residential (CR) districts. Much of the concern lies with the transitional CR-4 district with the closest proximity to the MU districts. 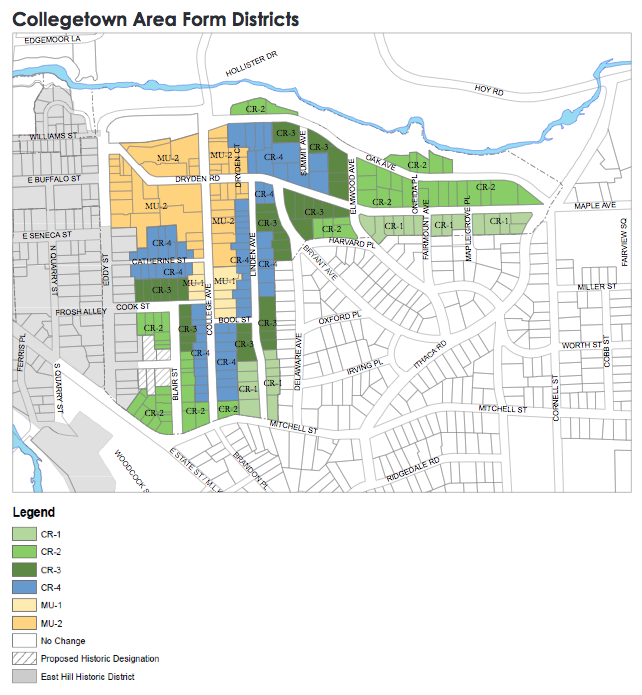 Under the rezoning proposal, Collegetown will have six newly formed districts: two for a mix of commercial and residential uses in the center, and four surrounding residential districts. Tom Hanna, one of Collegetown’s long-time residents, has voiced concern over the potential for consolidation by big developers under the law. “We specified to the city [a concern for consolidation] in the CR-4 zones,” said Hanna, a ’64 graduate of Cornell University and Collegetown homeowner since 1970. Hanna also serves as a member of the East Hill Civic Association. Hanna cites the low vacancy rate as a factor that keeps rent prices higher and worries the new policy will further increase the cost of living with a “gentrification” effect. The Cornell Daily Sun published his editorial on the issue in its Guest Room column last week. “While the plan does not specifically address the goal of affordability, it does clearly address the goal of supplying quality, safe housing,” said Seph Murtaugh, the Chairman of the Planning and Economic Development Committee. The rezoning measure also eliminates parking requirements for the multi-use districts and, if parking-management plans are approved, the CR-4 district. Factoring in space for parking can be costly for developers and, according to Murtaugh, is not as necessary with increasing use of alternative transportation. Murtaugh also pointed to other available parking nearby, including the Dryden Avenue garage that has been operating on average at only 50 percent capacity. A citywide Parking Director was recently hired to address policies as well. In 2007 the City and Cornell University commissioned Good Clancy Associates of Boston, Mass. and two sub-consultant firms for a total of $180,000 to evaluate Collegetown and make recommendations for future development. After some additional modification by the Planning Committee, “The 2009 Collegetown Urban Plan & Conceptual Design Guidelines” was published. In 2011, owners of affected property halted the plan’s implementation after challenging the parking exemption.